"Elegant, fruit driven wines from one of Auckland's closest vineyards." 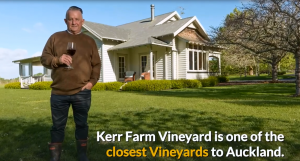 Kerr Farm Vineyard is one of the closest Vineyards to Auckland. We produce boutique, estate grown wines; Sauvignon Blanc, Chardonnay, Pinotage, Cabernet Sauvignon, Merlot, Syrah and our ever popular Bella Rosa Rosé wine. We are proud that our Sauvignon Blanc is one of the very few grown in Auckland, and like our other estate grown wines is crafted by our winemaker to enhance the unique characters of the Kumeu heritage grape growing region. Research by the wine writers Sue Courtney of the Webzine "http://www.wineoftheweek.com and Peter May of the worldwide Pinotage Club www.pinotageclub.blogspot.com indicates that our Pinotage vines are some of the oldest in New Zealand. "We make our wines only from Estate grown grapes."